Removes scale and stains from toilets and urinals easily. 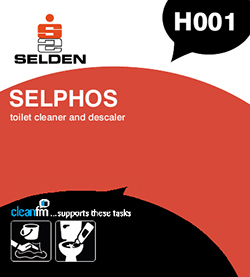 Kills odours at sources leaves toilets and urinals hygienically clean. Cleans and removes rust from metal work prior to repainting. For toilets and urinals. Also for cleaning and descaling of concrete and quarry tiles in shower areas and food processing plants. Toilets and urinals: Pour onto affected surface. Leave for 10 minutes, brush if necessary to loosen stubborn deposits. Flush or rinse away. Descaling: Dilute 1 part to 10 parts water. Apply with mop, leave for 10 minutes to penetrate, scrub as necessary. Rinse and allow to dry. N.B. 1. Do not use on or near linoleum floors, terrazzo, marble, stainless steel, chrome or enamel. 2. Regular use on concrete will cause deterioration and is NOT recommended. 3. Descaled metal should be painted immediately to prevent rusting.